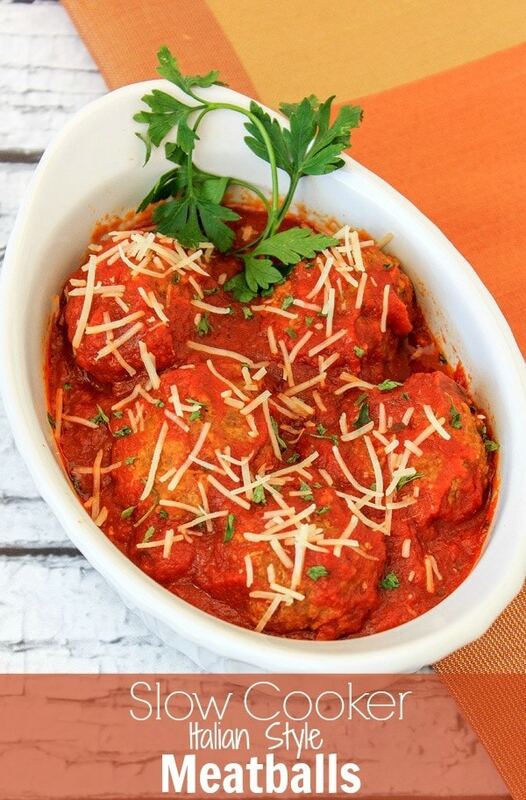 I turned my grandma’s original into these awesome Slow Cooker Meatballs. 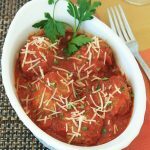 Italian style slow cooker meatballs make a great appetizer, main course, or go along with spaghetti or other Italian dishes. 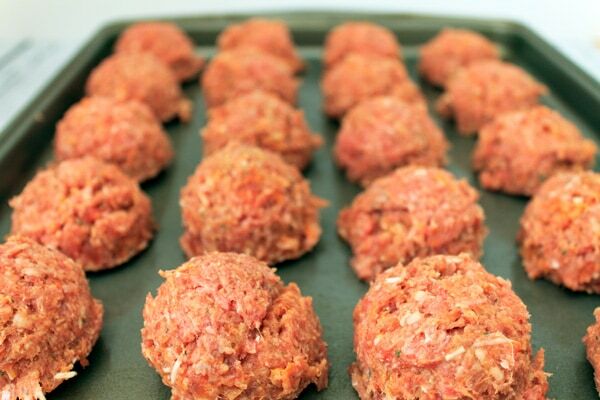 Be sure to pin this meatball recipe and add it to your list of party foods on game day. Are you ready for some foooooootball?? I am. Da Bears, baby! Which means friends and fam piling in, yelling at the TV, good eats, fun drinks. And, if you’re not, that’s totes OK too. You can still make my meatballs. These Slow Cooker Meatballs make Uh.Maze.Ing appetizers or are perfect over pasta. Maybe even a great sub sandwich! Just a bit of prep work, then set it and forget it. Personally, I ate four out of the pot before they even hit the table. Don’t tell. Make slow cooker meatballs as an appetizer, for meatball sandwiches, or to serve over pasta. 12 oz Italian sausage buy bulk or remove from casing -spicy, mild, pick your favorite! In a large mixing bowl, combine beef, sausage, eggs, breadcrumbs, cheese, garlic, salt and pepper. Now, I take off my rings and really get in there good and mix with my hands. It's how grandma did it, so it's how I do it. Don't worry, there's plenty of soap and water to wash up! This makes 45-50 meatballs so you'll want to lightly spray 2 baking sheets. To form meatballs you can either eyeball and roll the size of golf balls or use a small ice cream scoop. Either way, you want them all to be the same size. Drop on baking sheets about 1 inch apart. Place on top rack of oven. Bake for 10 minutes, flipping each over 1/2 way through. You just want to make sure the outsides are browned. They will finish cooking in slow cooker. Go ahead and set the slow cooker on low. When meatballs are browned, place them in your slow cooker and cover completely with sauce. Cover and let those babies cook for 4 hours. 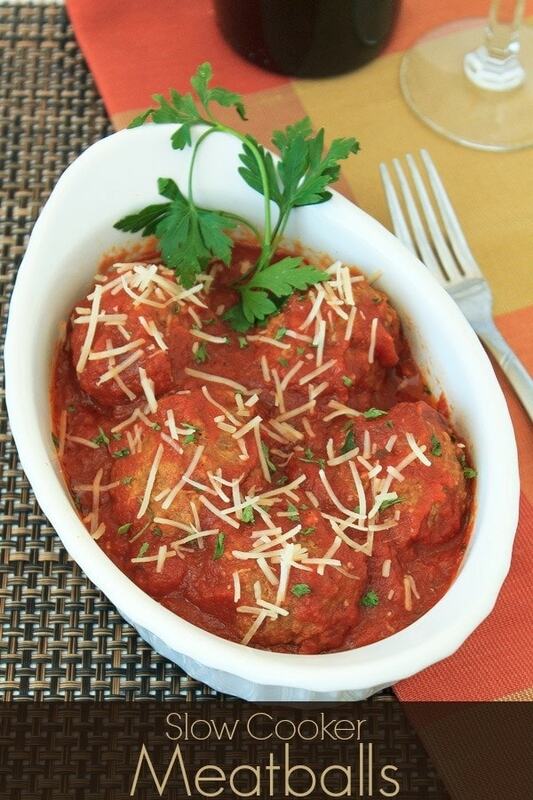 These meatballs will fill your house with a wonderful aroma while cooking in the slow cooker! These are great for any party appetizer. Just poke each with a fancy, schmancy toothpick and your guests are set. 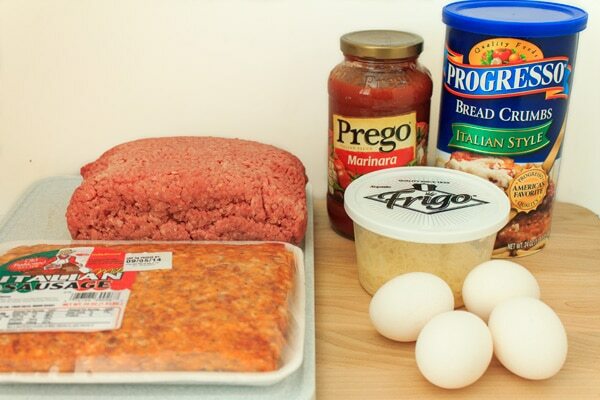 To serve as a main dish, plop a few on some pasta or make some awesome meatballs subs. We make a whole batch and freeze about 1/2 of them prior to cooking and come out with 2 great family meals. ENJOY! Next time you’re watching the Bears, think of me. I’ll be popping a few in my mouth right along with ya! Be sure to share this recipe with friends and family. Subscribe to the blog for more recipes like this one. Have you ever made Slow Cooker Meatballs? I love homemade meatballs but I have never tried making them in the slow cooker! Thanks for the idea! Slow cookers rule! Great recipe, thanks. Nom nom nom! I am from a big Italian family, so meatballs are a MUST in our house. I love that you mix half sausage, half ground beef. What a great idea! And crock pot meals are always amazing. Thanks for sharing! I have not made meatballs in years but never in the slow cooker. I am going to have to try though because those look amazing! I am always looking for new ways to use the slow cooker. I love this idea. Every member of our family loves meatballs. Those look great! I so have to try making meatballs in my crockpot! There’s nothing like some great homemade meatballs. I have never tried making them in the slow cooker before. I love anything that I can make in the slow cooker! These look so yummy! I usually do them in the oven or stovetop, but the slow cooker is even easier. They look so good! This sounds really good. I love anything I can put in a slow cooker! You know how I roll! Delicious? Check. Easy? Check. Looks like we have a winner! These look really good. Delicious and easy to make is always a winner for me. This looks super tasty and super easy. I’ll be making this soon! This looks so good! I haven tried meatballs in the slow cooker but am thinking I need to soon! Oh I love that you put sausage in these! Now that’s a meatball! I make a similar recipe! We eat the for game day parties all the time! Super yummy! Italian, meatballs, and a slow cooker, I am sold on this recipe. It looks delicious. You can never have too many meatballs! I have to try to find a way to make them paleo – but these look delicious! slow cooker and meatballs! this is something i make for almost every event. the food stays warm, i put out a big basket of fresh buns and everyone is happy. Those look really delicious. My oldest has been asking me to make meatballs for a while now. Maybe I’ll make her some tonight? The entire family would actually be happy I did. These don’t seem like that much work to whip up. What an awesome recipe. I know my family will love these. Pinned this for the future making. This looks really tasty and really easy. Those are my two main needs when I’m cooking. You can’t beat a good crock pot recipe. looks yummy! can’t wait to make them! this sounds so delicious!!! can not wait to try these!! I just got a slow cooker and can’t wait to try this. They sound and look delicious. Love LOVE LOVE this!!! I make mine in a slow cooker in the winter months as well!!! This looks really terrific!! Thanks so much for linking these with us at #foodiefridays!!!! Have a terrific weekend! I love slow cookers, and the Bears! Too bad they aren’t doing so well this season…. as a Cubs fan, I’m used to saying there is always next year, but I never wanted to say it about the Bears. Oh well!! Anyway, adding this to my to-make list and sharing! Thank you for sharing this at #FoodieFridays! DA BEARS! I am always looking for slow cooker recipes and this one looks delish. Thank you! Oh, those look so good! I love Italian food. Definitely pinning this! This looks super yummy, and easy too! Thanks for sharing your recipe! What a great idea! I’m always looking for good slow cooker meals! Thank you for sharing! Thanks for sharing at Best of the Weekend – being featured tonight! These look good. I make mine a sweet and sour flavor, but I’ll give these a shot.